make-it-wales: John Ritchie - working for BA show. John is currently making sculpture inspired by derelict chapels and buildings. He is also involved in creating complex ceramic surfaces with glaze and ceramic Decals. "I create abstract sculptural ceramics that are inspired by either the urban or the rural landscape. In my work I look to obscure the obvious, with the intention of intriguing the viewer and inviting closer inspection. The idea of contrast is an important sub-plot of my work. 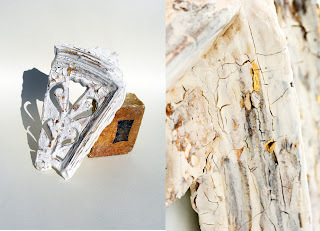 My latest work combines mouldings copied from derelict buildings together with photographic images to create sculptural pieces that are designed to highlight both the number of decaying that are allowed to fall into ruin while there is a reported housing shortage and the gradual loss of the traditional skills used in the construction of these building."